Kevin is a 2005 graduate of Coastal Carolina University and is currently enrolled as a graduate student at the University of North Carolina Charlotte. 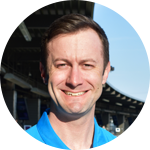 He has been a PGA Class-A member for over 15 years and brings over 20 years of teaching and club fitting experience to Topgolf. During his time in the golf industry, Kevin has given over 15,000 golf lessons and performed over 10,000 club fittings. Kevin has received Outstanding Achievement in Instruction awards in 2006, 2007, 2014, 2015, and 2017 in the Southwest PGA and Carolinas PGA sections. Kevin is an active tournament player on the Carolinas Section PGA tour and has been competing as a professional since 2005. Kevin is a personal golf coach for current and former NCAA, Futures Tour, WLDA, NFL, NHL, and NBA players. His teaching experience covers men, women, junior and senior golfers of all abilities. Kevin directs his teaching focus towards the specific goals of every student, whether it's swing technique development, game fundamentals, or overall improvement of all areas involved in the game. He will help you diagnose “what is wrong", and then prescribe the correct actions to take in order to “fix” the issues.